Jessica’s article touches on the famous “marshmallow experiment” and the positive side-effects of being able to delay gratification. When it comes to saving, do we have to develop super-human will power to defeat our natural instant gratification impulses? Not necessarily. Jessica suggests it’s more about using some simple tricks to distract yourself from your spending impulses. FamZoo uses these same techniques to help parents build solid saving habits in their kids. I really enjoyed Mir’s witty, well-written post about her new allowance approach and the benefits of having an automated, online, cash-less system. She shares some entertaining commentary on the age-old question of whether to tie chores to allowance. Her approach: she delivers regular allowance independent of chores, but docks the kids for non-compliance. I’ve always rather liked that middle-ground model. For their allowance system, they happen to use a hand-crafted solution built using Google Docs by her “handsome and wonderful—albeit geeky” husband “Otto”. That’s completely OK with me though. Hey, you gotta respect “geeky” spouses! Whether you use a packaged solution like FamZoo or roll your own using anything from spreadsheets to pencil & paper, the key thing is to have a system and to use it in a way that consistently reinforces your family’s values. Dan provides some nice detailed advice for teaching key money lessons as your child matures through the elementary, middle-school, high school and college years. Check out the advice sections at each stage, and see how you’re doing as a money mentor. Got a few minutes to fritter away? 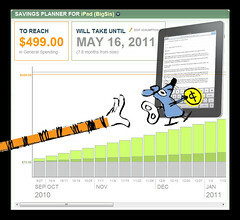 Check out this “Financial Game of Life” animation from BillShrink.com. Just click on “Spin”. Bill, thanks for your comment on my blog. Would you please email me at akazookeeper@verizon.net? I would love to have a chat with you!